Breathe in and experience the atmosphere of a lush forest! This is the promise of the Austrian contribution “breathe.austria”, where visitors to the Austria Pavilion can fill up with fresh air from a real, living forest. The World’s Fair will be held from 1 May to 31 October 2015 and explore the theme “Feeding the Planet. Energy for Life”. More than 140 countries and organisations will present their vision for the future of our planet at the Expo 2015 in Milan. One of the most original projects in Milan is likely to be Austria’s contribution – breathe.austria – a pro-active climate concept which demonstrates the beauty and the power of nature. 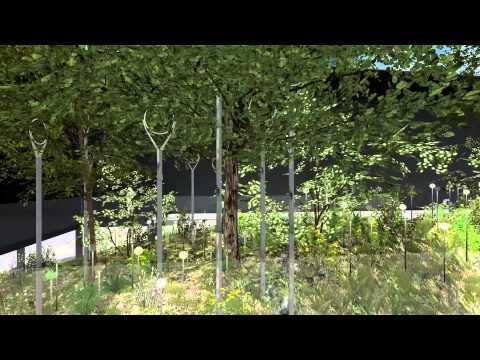 The concept will be realised as a forest with around 60 trees with heights of up to 12 metres, creating a refreshingly cool microclimate with excellent air quality with an array of shrubs, bushes, mosses and lichens. The focus is on the environmental performance of the 560m² forest, which works like an air factory: in a single hour it produces enough oxygen for around 1,800 visitors. In addition, dye solar cells are used to generate power: energy is produced from light on the principles of photosynthesis. The Austria Pavilion is an impressive example of how to develop forward-looking solutions to global problems by combining natural and technological processes. The unusual design will also be reflected in the catering provided by top Austrian chefs, who will be cooking up delicacies from the best the forest has to offer. The Austria Pavilion will also serve as a meeting place for companies from all over the world.